November 1, 2016. Baltimore, Maryland. It’s ten years today since the Stardust closed its doors…With the impending doom of implosion on the horizon, my husband and I booked a room for that final night and invited a small group of artists to gather and mark the occasion. Of the nine artists who participated —Aaron Sheppard, Brent Sommerhauser, Danielle Kelly, David Sanchez-Burr, Erin Stellmon, Stephen Hendee, Wendy Kveck, Yo Fukui and myself— six were MFA students of Stephen’s at UNLV. The gathering was somewhat inspired by their “One Night Stand” art events in hotel rooms and vacant spaces as well as a mantra I heard in grad school just a couple years earlier (from visiting artist Nayland Blake) to “make art for your friends.” With all that in mind we invited this fantastic bunch of artists to join us for the night everyone was talking about in Las Vegas that October. There is not a lot of documentation of that evening but I've included here the best highlights of what I’ve been able to gather. My memory is foggy of what happened when but I recently found my 2006 datebook which notes that Jovi Schnell's visiting artist lecture at UNLV started at 7 p.m. which confirms that everyone started trickling in around 9 p.m. greeted by Stephen's tape drawings on the walls including "Probably" above the bed. Image. Wall text by Stephen Hendee (pictured.) Photo by and courtesy of Jovi Schnell. Brent Sommerhauser installed a long horizontal contour drawing of the Vegas skyline, which we all knew was about to change. He recently told me via email: "I do recall that I'd intended to cut a small section of the room out, perhaps behind a painting or something. I had my demolition tool bag on me, but took it back to the car when I saw that security was checking bags at the elevator." Image: Brett Sommerhauser contour drawing of Vegas skyline and a guest, George Pasterk, Katie Anania, Catherine Borg and Aaron Sheppard. Photo by and courtesy of David Sanchez Burr. I think the kick-off to the evening's performances was Erin Stellmon and Yo Fukui in fall-out gear: Tyvek suits with mushroom clouds on the front, customized gas mask trunks, and covered in battery powered lights to perform a dance to Elvis Presley's "Viva Las Vegas." A fitting tribute given that in the early days of the Stardust which opened in 1958, tourists gathered at the resort to watch the atomic blasts at the test site. Erin is the person who clued me in that the shape of the amazing Stardust sign was a reference to the spectacular mushroom clouds. Image: Erin Stellmon and Yo Fukui performing "Viva Las Vegas." Photo by and courtesy of Jovi Schnell. Image: Erin Stellmon and Yo Fukui perform "Viva Las Vegas." Photo by and courtesy of David Sanchez-Burr. David Sanchez Burr's performance Stardusted included the gutting of a fish. The documentation of that performance was later integrated into a video work, pictured below. Image: David Sanchez Burr performance. Photo courtesy of David Sanchez Burr. 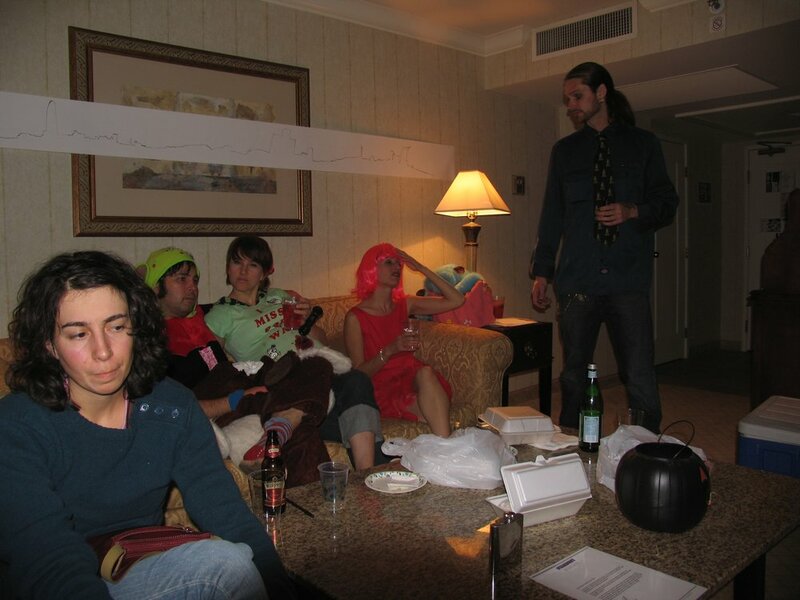 Image: Watching a performance in room 11515. Courtesy of David Sanchez Burr. David Sanchez Burr, still from Stardusted, 2006. Courtesy of David Sanchez Burr. Aaron Sheppard's performance, challenging notions of gender and identity, was an intimate transformation imbued with spectacle. Image: Aaron Sheppard performance. Photo by and courtesy of Jovi Schnell. 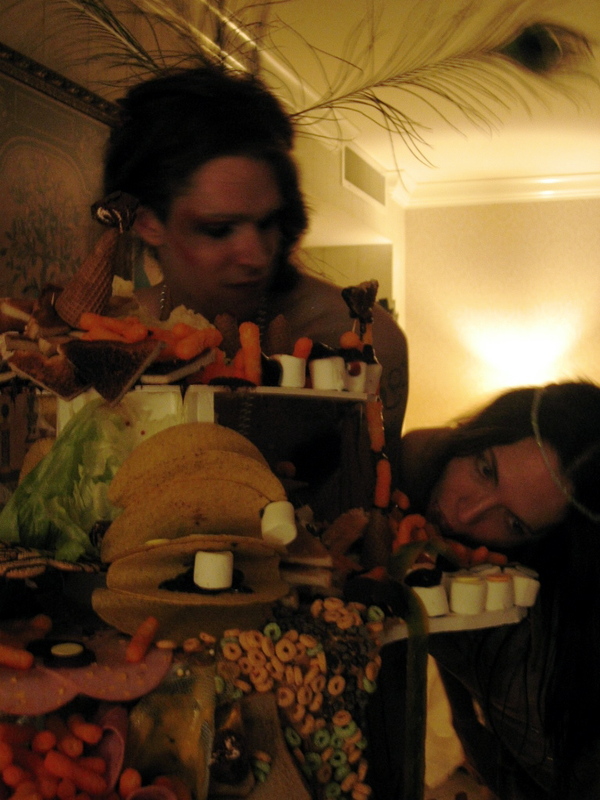 Image: Aaron Sheppard and Danielle Kelly with Wendy Kveck food sculpture. Photo by and courtesy of Jovi Schnell. Image: Jovi Schnell and Lake Newton. Photo by and courtesy of David Sanchez Burr. My performance was the last of the evening as we had to de-camp to the parking lot. I think it was about was 3 a.m. and I learned that helium has very little lift power...Instead of ascending the cluster of foam, paint and glitter stars of various sizes I'd made, I lit some kind of firework (as I was prone to do back then) and sent up the tiniest and lightest star. We watched it slowly drift up the side of the building and away. Video of this is included in my 2007 work I only have stars for you; you only hold stars for me. Image: Catherine Borg before performance. Photo by and courtesy of Jovi Schnell. The notion that there would be an abundance of documentation of this gathering were it held today has come up several times with participants I have been in touch with recently. But I wonder even ten years from today if that would be true...An inspection of my own digital archive shockingly and sadly revealed that the images of the Stardust I took the week before it closed, during its implosion and the mostly empty lot the next day are currently missing. They may still turn up and I really hope that they do but this discovery led me to read more carefully “In the Future, We Will Photograph Everything and Look at Nothing” (April 4, 2016, The New Yorker) by Om Malik who opines "photos are less markers of memories than they are Web-browser bookmarks for our lives. And, just as with bookmarks, after a few months it becomes hard to find photos or even to navigate back to the points worth remembering." I re-read the article as a corrective, enforced also by a recent email from Katie Anania who shared the following: "I started reading the catalog for a great show at the Princeton art museum, 'The Life and Death of Buildings: On Photography and Time,' and curator Joel Smith thinks that the camera is the answer. Only the photograph, he thinks, can capture 'flashes of awareness of the depth of history embodied in a building.' "
Last week I made a brief and quiet pass through Las Vegas and spent a reflective hour alone on the rooftop of Circus Circus’ almost empty Garage 2 under swirling skies, the same spot where I witnessed the implosion of the Stardust, March 13, 2007. The site plainly embodies Robert Smithson’s idea of “ruins in reverse” both in form and symbolism. After the implosion in 2007, Boyd Gaming quickly broke ground and began building the 4.8 billion dollar Echelon complex. But in 2008, shortly after the crash, construction was halted and further development postponed and ultimately canceled. The property was sold in early 2013 to a Malaysian gaming company with plans to build and open the 7 billion dollar Resorts World on the site by 2019 but there is still no activity on the site and the project plans seem speculative rather than absolute. For those of us who have known Las Vegas up close and from behind the spectacle, we know it is the epitome of America, not an anomaly, and that the Stardust/Echelon/Resorts World site is a monument to that reality. The hulking steel and concrete skeleton structures exemplify that 2006 was an unwitting precipice while ten years on 2016 feels like such an obvious one. Donald Trump's gold Trump Tower poignantly hovers over the scene with meaning imbued by your respective politics, history, heritage and bank account. For me, it's the opposite of Stardust in my eyes until I think of all the friends that were there that night, now in Las Vegas, Baltimore, Joshua Tree, Japan, New York, Austin, Los Angeles and Las Vegas, New Mexico. Our scattering does not erase the zeitgeist of that night at the Stardust and the interesting view we shared and reflected upon together of Las Vegas through our work and gatherings. An anniversary worthy of memory. Catherine Borg is an artist who lived in Las Vegas from 2004-2011. She currently lives and works in Baltimore, MD with husband Stephen Hendee and cats Jack and Sissy, who were born under their house in Las Vegas. If you have ideas or further recollections to contribute to this post, please post in our comments or email wendy@settlersandnomads.com.